The massive wooden base is as stable as they come. 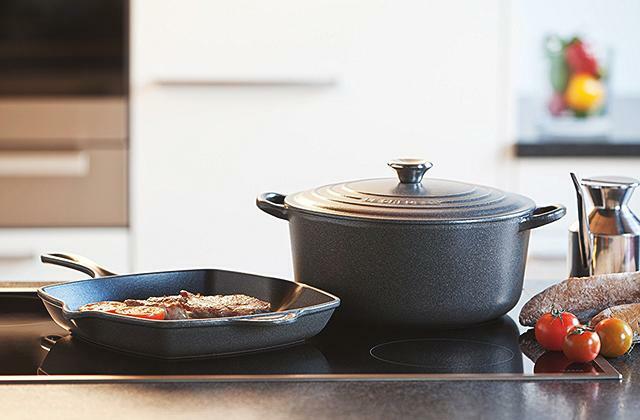 The product comes equipped with a built-in thermometer and hygrometer. 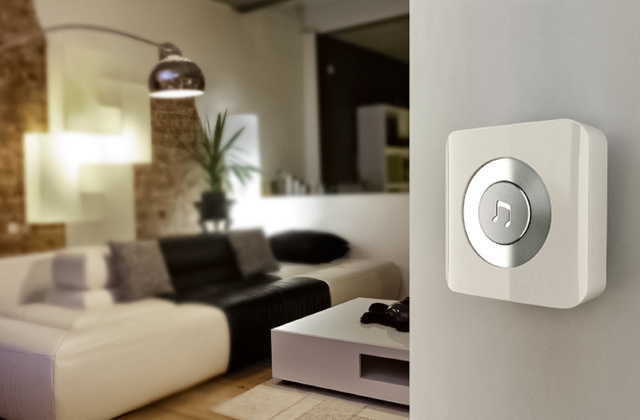 An LCD screen in the wooden base will tell you the temperature and the level of humidity in the room. The temperature is displayed in Fahrenheit. Eno FITSKY is arguably the best storm glass on our list and one of the better models on the market right now. 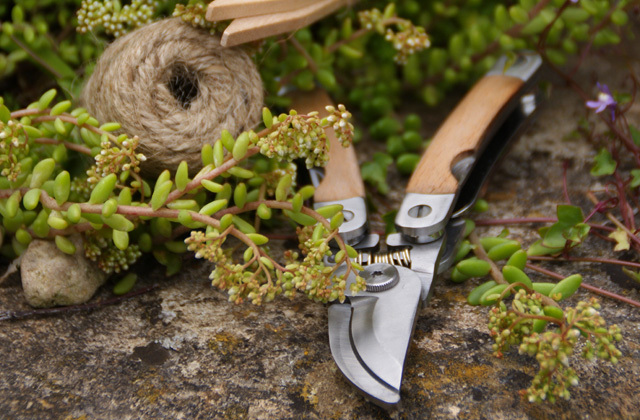 It is just as lovely of a decoration piece but, unlike its counterparts, the model is also a functional device with value outside of appearance. With its creative globe shape, there isn't a room that this item wouldn't be able to embellish. Though the glass looks chic and elegant, it is surprisingly sturdy. 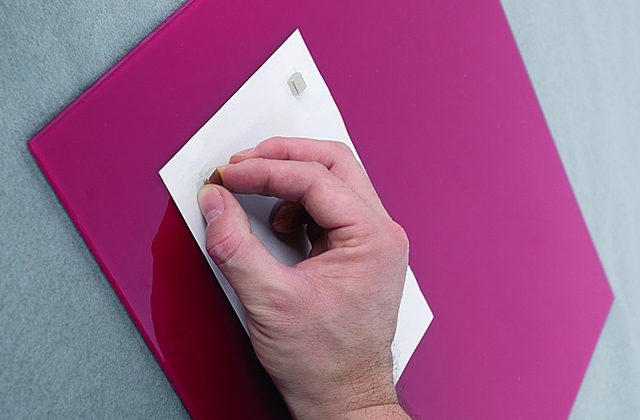 You'll hardly be able to accidentally scratch it and the whole thing easily withstands rapid temperature changes. The base isn't entirely stable. 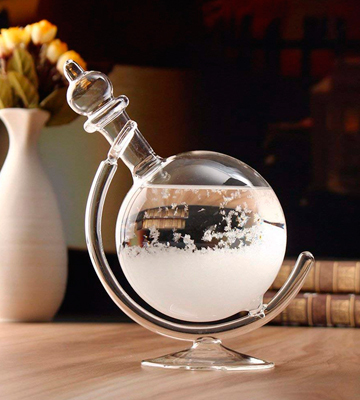 Aissimio CAVEEN is a little different from an ordinary storm glass. That's why we would recommend it to people who are looking for something different, a nice catch for themselves or a great gift for somebody you care about. The model's minimalist design underlines and blends with the interior instead of attracting all of the attention to itself. There are information marks printed on the glass that will help you interpret the changes in the solution. The lacquered wood is prone to scratches. 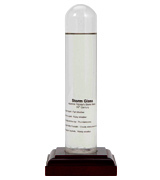 Admiral Fitzroy's Storm Glass is a wonderfully simple antique reproduction. One could argue it is more tasteful. It is definitely just as elegant as the rest of these models. Plus, it takes up a lot less space and doesn't cost quite as much as the rest of these items. Adding up to 7 x 4 x 6 centimetres in overall dimensions, the storm glass is about the size of your average bird, maybe even smaller. 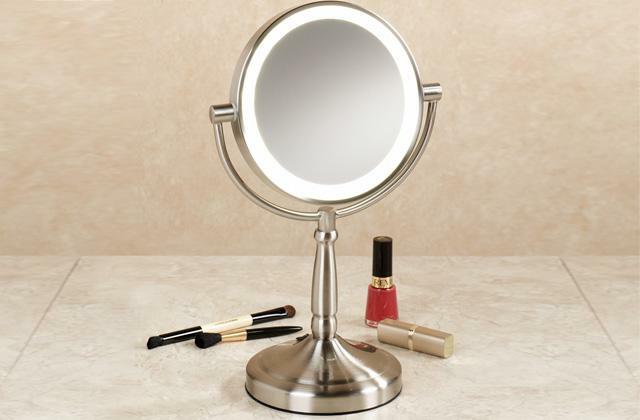 You won't have to redecorate your place to find enough room for this item. You can put it on the bookshelf or onto your nightstand. Doesn't include an information brochure. 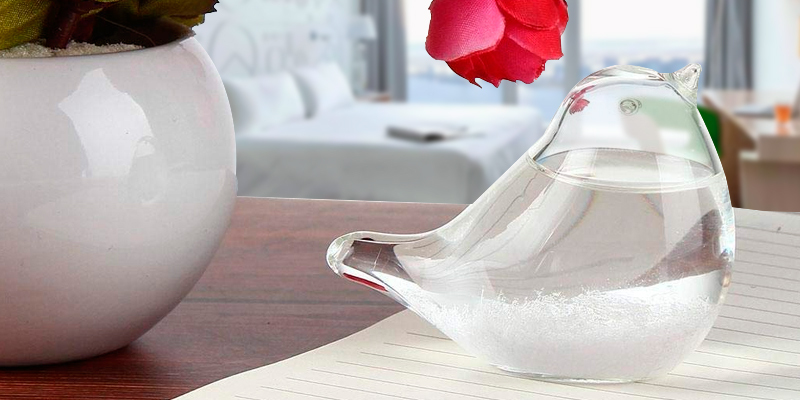 If you do not care for the whole antique aesthetic and instead looking for something more modern, something that will better mesh with your interior, you can't really go wrong with this little storm glass birdie from KOBWA. The product serves as an excellent conversation starter. As a sign of upcoming snow, its crystals start to produce the most wonderful patterns. It comes with a cardboard gift box, making the whole thing a lovely and surprisingly affordable gift. The crystals need some time to adapt to the environment. Pawaca LEPTS4430 is nothing short of a steal. 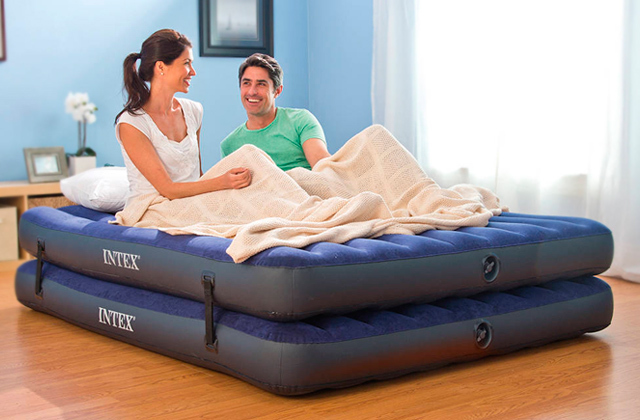 Its wooden base provides a stable foundation, so you can put it on any surface. It will spice up your room, adding a touch of class to it. For less than 10 quid, that's hardly a bad deal. A storm glass is an old invention that, from a practicality standpoint, has become all but obsolete. Well, more precisely, regular storm glasses may have become obsolete. But Eno FITSKY is anything but regular. It may look the start, with that classic teardrop profile on top of a nice wooden stand. It just as well serves as a gorgeous decoration, a nice little ornament that could class up any room. But the model isn't just that. On top of its visual value, this is also a functional device. The product comes equipped with a built-in thermometer and hygrometer. 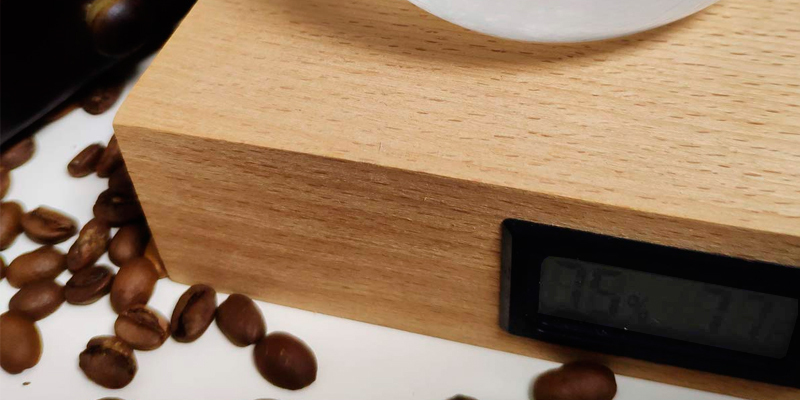 An LCD screen in the wooden base will tell you the temperature and the level of humidity in the room. Just like its predecessors, Eno FITSKY works as a weather station. Except, unlike those predecessors, it is actually accurate and reliable, combining an elegant appearance with functionality. The only downside of its functionality is that the temperature is displayed in Fahrenheit. Of course, it wouldn't prove a downside for everybody but it would be nice if you could choose between that, Celius, and Kelvin. Other than that, one could make an argument that Eno FITSKY is the best storm glass on our list and one of the better models on the market right now. It is just as lovely of a decoration piece but, unlike its counterparts, the model is also a functional device with value outside of appearance. You can't really quantify attractiveness as it is definitely one of the more subjective notions. That being said, very few people would argue that Aissimio CAVEEN looks anything short of stunning. 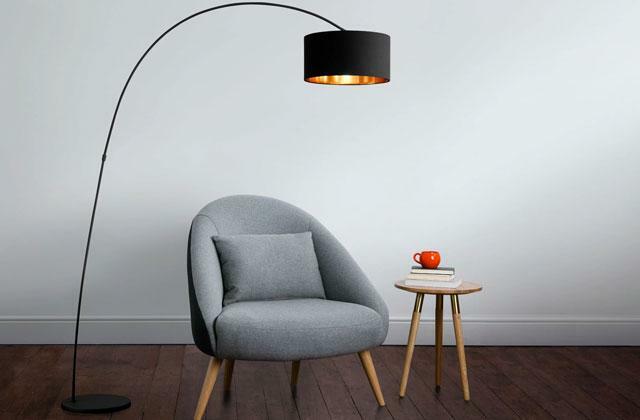 With its creative globe shape, there isn't a room that this item wouldn't be able to embellish. Though the glass looks chic and elegant, it is surprisingly sturdy. 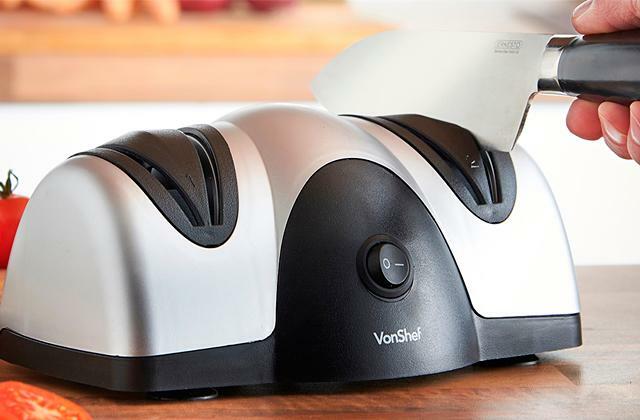 You'll hardly be able to accidentally scratch it and the whole thing easily withstands rapid temperature changes. As it is always the case with storm glasses, the model features a transparent solution that consists of several chemical substances. With changes in weather and temperature, the appearance of the substance transforms from clear to cloudy to crystal flakes. When it's sunny, the substance sinks to the bottom, so the liquid becomes clear. When it's snowy, the liquid crystallises, creating the most remarkable patterns. When the weather gets cloudy, the said liquid becomes appropriately hazy. Of course, it still isn't as accurate as any half-decent thermometer, so think of it as more of a bonus and the visual part as the biggest part of the sell. Needless to say, this thing makes for an ace gift, even without the nice cardboard gift box that comes with the package. 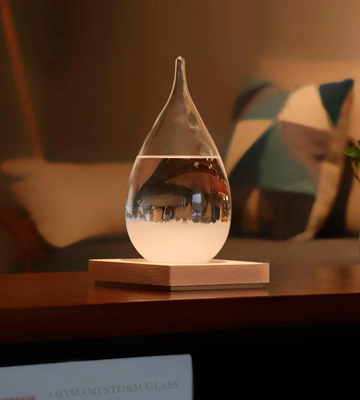 With all of that in mind, Aissimio CAVEEN is a little different from an ordinary storm glass. That's why we would recommend it to people who are looking for something different, a nice catch for themselves or a great gift for somebody you care about. The people behind it call Admiral Fitzroy's Storm Glass "a wonderfully simple antique reproduction" and, as far as we're concerned, this is as accurate of a description as they come. It isn't as showy and garish as these things often tend to be. Its minimalist design underlines and blends with the interior instead of attracting all of the attention to itself. 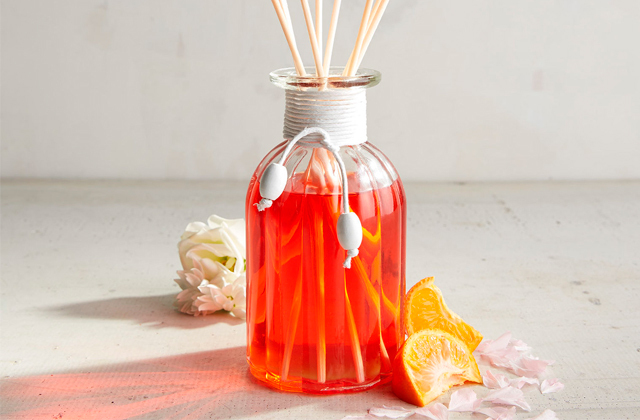 The whole thing adds up to 6.5 x 6.5 x 17 centimetres, the latter being its height, so you'll easily be able to find enough space for this item on your desk or anywhere else in the room. The elegant wooden base serves as a nice stable foundation. Though its elegance is a bit of a double-edged sword as the lacquered wood is susceptible to scratches. 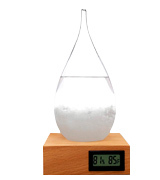 Just like any other storm glass, the model can be used to predict the weather 2 days in advance. There are information marks printed on the glass that will help you interpret the changes in the solution. In short, clear liquid indicates fair weather. Murky liquid suggests an upcoming rain. Crystals at the top mean that a thunderstorm is coming. Large flaky crystals appear when the weather is about to get cloudy and snowy. And, when the wind is on its way, this little device will warn you with threads of crystals. In conclusion, Admiral Fitzroy's Storm Glass might be simple. But one could argue it is more tasteful. It is definitely just as elegant as the rest of these models. 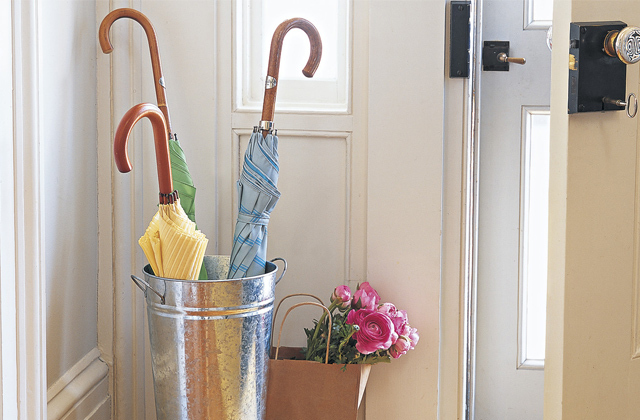 Plus, it takes up a lot less space, making it the best storm glass for people with a limited amount of free space. As you can probably tell from the image, this model from KOBWA looks nothing like your typical storm glass. It doesn't have that dignified, antique appearance that people have come to expect out of these things. Some may view it as a disadvantage. We don't. Sure, it wouldn't be able to class up the room. But it will prove to be a much more suitable addition to any modern or even contemporary interior. 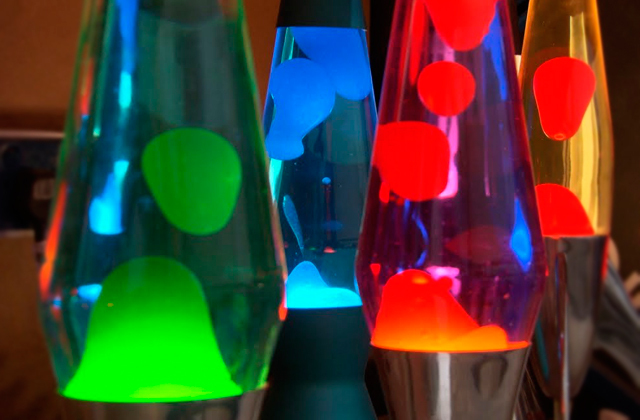 It will not stand out as much, so it will be able to effortlessly blend in and mesh with the rest of your décor. Plus, this thing is a lot smaller than most of its competition. Adding up to 7 x 4 x 6 centimetres in overall dimensions, it is about the size of your average bird, maybe even smaller. 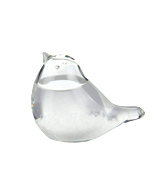 You won't have to redecorate your place to find enough room for this little birdie. Now, it doesn't come with an information brochure, which is a bit of a shame. But not really much of a downside given that you can easily google all of that information anyway. It does, however, include a cardboard gift box, making it a great gift for your friends with interests in the ornithology field. Of course, the model contains the same solution as the rest of these storm glasses, so you'll be able to enjoy the most stunning patterns and even use them to predict the weather if you feel so inclined. 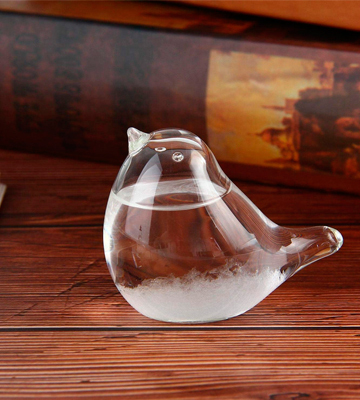 Taking all of the above into consideration, if you do not care for the whole antique aesthetic and instead are looking for something more modern, something that will better mesh with your interior, you can't really go wrong with this little storm glass birdie from KOBWA. Pawaca LEPTS4430 is a classic. 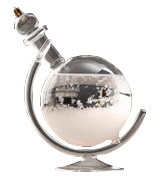 Well, the model itself isn't but its appearance resembles the original 18-century storm glass to a tee. The biggest reason we've added this product to our list, despite the fact that Eno FITSKY has more or less the same aesthetic, is because the former costs about 4 times more. Sure, it also includes a thermometer and hygrometer, so the price is justified. But if you do not care for those and simply want a decoration piece, LEPTS4430 is the model to go for. For around 8 quid, you'll be able to acquire the most delightful gift. It has enough charm and elegance to spice up just about any room. Plus, it serves as an excellent conversation starter. For the most part, what we're dealing with here is an ordinary storm glass. It has more or less the same solution, with crystals sinking to the bottom and the liquid part becoming clear before sunny days, liquid becoming equally hazy and murky prior to rainy weather, and crystals forming the most wonderful patterns as a sign of upcoming snow. And, again, as it is always the case, these crystals need a week or two to adapt to the environment, so don't worry if they don't start producing any results right away. To sum it up, for its price, Pawaca LEPTS4430 is nothing short of a steal. 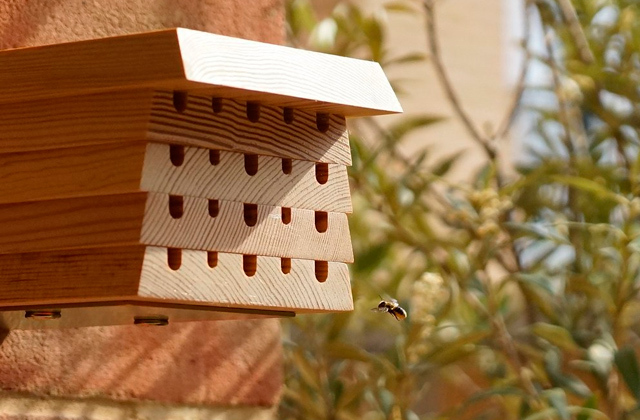 Its wooden base provides a stable foundation, so you can put it on any surface. It will spice up your room, adding a touch of class to it. For less than 10 quid, that's hardly a bad deal. 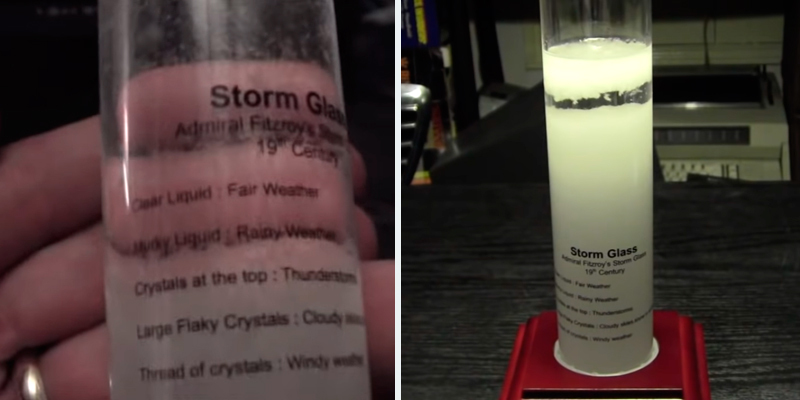 What Is a Storm Glass? Although there are a lot of ways to predict weather nowadays, such as accurate weather stations, barometers, and weather thermometers, some of you might still be interested in getting one of the storm glasses. Invented in the 18th century, this device was believed to predict the weather, especially strong winds, storms, and tempests. This was the reason why it was called a storm glass. 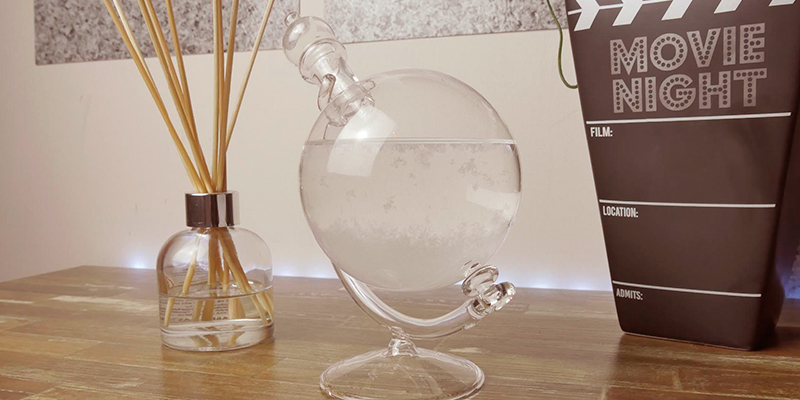 The device is an indoor glass flask with chemical liquid (consisting of ethanol, distilled water, ammonium chloride, potassium nitrate, and camphor) inside. These very components could stay liquid or transform into crystals of different shapes and sizes, thus predicting the weather. For example, clear liquid meant a bright sunny day while thread-like crystals at the top of a flask forecasted windy weather. As for modern application, scientists can’t say that this device is a reliable weather forecaster. 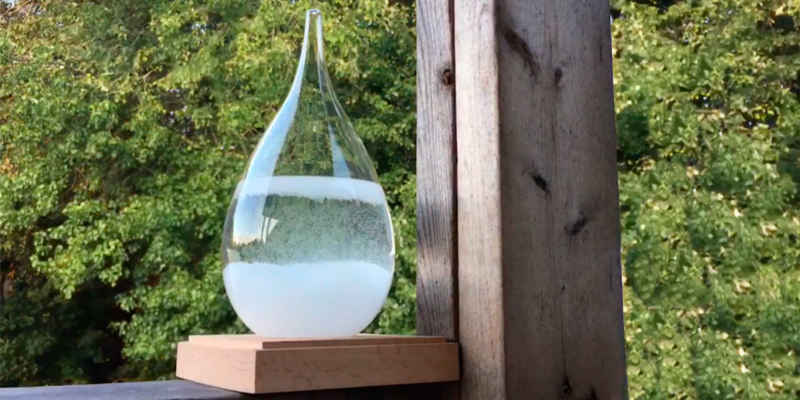 Yet, if you place your storm glass in a light and well-ventilated room, you might observe the changes inside that would probably coincide with the weather forecasts on your smartphone. 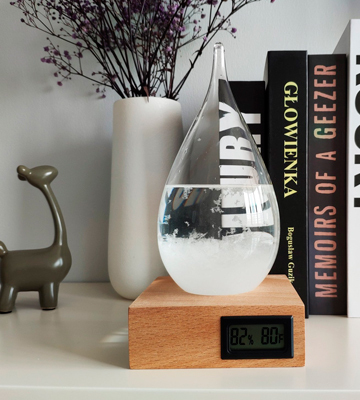 Even if a storm glass can’t be used for 100% weather prediction, you still might want to have it as part of your interior. It can add elegance to any room decorating your office desk in an office or coffee table at home. 1. 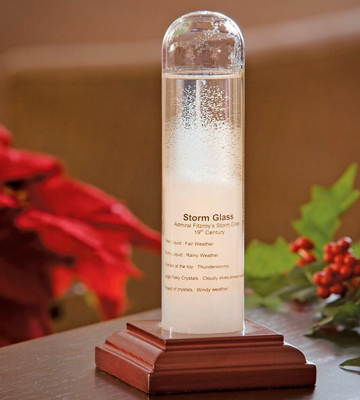 Storm Glass, Wikipedia. August 26, 2017. 2. Anne Marie Helmenstine How to Make a Storm Glass To Predict the Weather, ThoughtCo. December 29, 2017. 3. 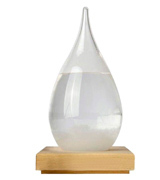 David Grossman Who Needs a Lava Lamp When You Can Make a Storm Glass? Popular Mechanics. January 02, 2017. 4. David Hambling Storm Warning: Can Crystal-Gazing Predict the Weather? New Scientist. December 16, 2014. 5. Weather Forecasting With Crystals, Bang good. January 15, 2016.